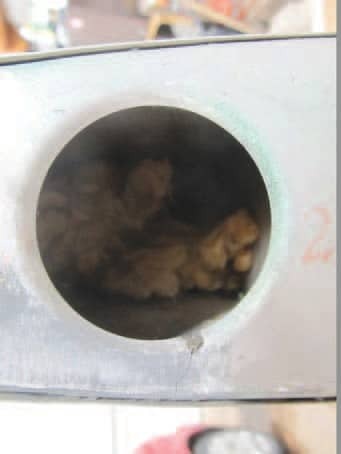 Cessna Approved Bad Training | Tennessee Aircraft Services, Inc. If you own a legacy Cessna as I do, you already know how difficult it can be to keep up with the needed maintenance. Beside the required annual inspection, there’s a seemingly endless stream of repair items. Just when we think that all that can break has broken, some new unexpected problem pops up. These things happen in part just to prove our planes can do lots of bad all by themselves. However, sometimes unaware owners, aircraft handlers, mechanics and flight instructors seem bent on adding even more bad to the list of aircraft ownership troubles. There’s been a lot of discussion in recent history concerning MIF (Maintenance Induced Failures). Usually we think of a MIF as a problem caused by incorrectly performed maintenance. 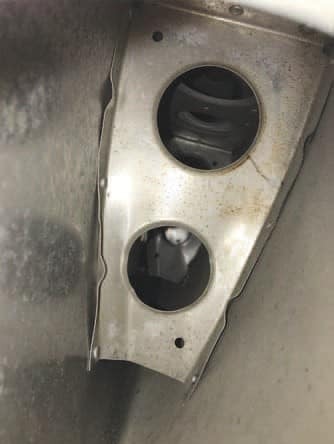 Problems may include leaving a bolt or screw loose that eventually fails some function of the plane or performing some maintenance function that causes a failure of an unrelated system. A common example is removing an instrument from the panel, causing broken wires or dislodged terminals, and then leading to seemingly random systems failing. Another failure category we prefer not admitting is the OIF (Operation Induced Failure). I admit OIF isn’t nearly as catchy as MIF, but it fits the issue. An OIF would be defined as a failure caused by mishandling of the airplane. Examples would include pushing the plane a little too far into the T hangar, taxiing out of parking and hitting that safety cone with the prop, leaving the oil cap off the engine, running tires past wear limits to failure, exceeding nose gear tow limits or spraying water into the static port. The damage from these examples is pretty obvious to a casual observer. The more insidious failures are those that are hidden from easy view. It’s very likely many, if not most of us, began our flight training in a Cessna 150 or 152. Getting the tow bar out just to turn the plane around was just too much trouble. It was so cool when our flight instructor showed us how to push down on the horizontal stabilizer to lift the nose wheel and easily swing the plane around any direction we wanted. Naturally, we used the same trick when we moved up to the 172 or 182. These heavier plans required a bit more effort but still doable. Finally, we made the move into the heavier world of a 210 and thought how convenient pushing the tail down would be for swinging the plane around in front of the T hangar. In the immortal words of Barney Fife, “let’s nip this in the bud” before any more unnecessary damage is done. One would think the horizontal stabilizer would be fully capable of withstanding the load of holding the tail down. In fact it is, but only when the down force is properly spread over the entire surface as it would be during flight. Pushing down by hand focuses all the pressure into a few square inches, overworking the light duty ribs and few rivets under the skin. How is it that our flight instructors demonstrated this poor behavior, and we often see the same action by our mechanics? 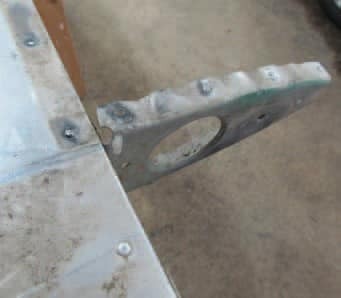 A Cessna 150 horizontal leading edge rib cracked. The initial perpetuation of this damaging operation can be traced directly to the Cessna service manual for these planes. 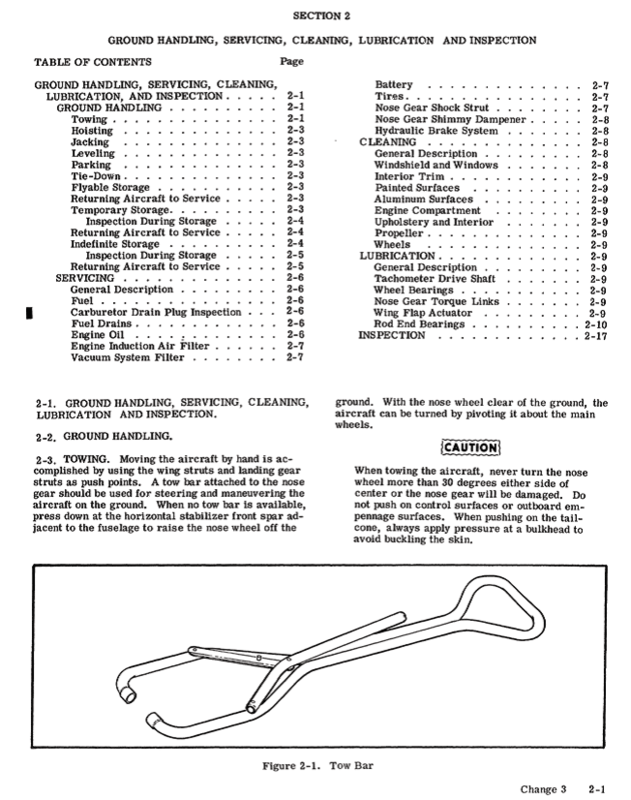 Most of the legacy service manuals have a paragraph near the beginning of Section 2 for Ground Handling. In this paragraph it details this exact procedure of pushing down on the horizontal for aircraft relocation if a tow bar isn’t readily available. It does specify pushing only on the forward spar, which is a fine point apparently long forgotten. I’m sure the good folks at Cessna back in the day thought this was a great idea. Fast forward a few decades of operation, and we realize just how damaging this can be. The typical first damage is the forward corner of a nose rib breaks off where the rivet attaches. A gentle squeeze of the leading edge will generate a clicking sound caused by the two broken halves of the rib passing each other. Longer term abuse will bend the entire rib. It’s very common to have multiple ribs damaged with no obvious visible change in the external shape of the skin. Another 150 cracked rib. On this model this damaged inboard rib is also the primary forward structural attach point that secures the horizontal to the tail cone. The repair is as simple as drilling the rivets out of the underside of the affected side of the horizontal and installing new ribs as needed. Lest we forget, this is an airplane, so there’s no chance it can be this simple. The complexity in this case is getting everything apart to finally gain access to the ribs. The horizontal leading edge skins on most single engine Cessnas wrap all the way from the top of the aft spar around the leading edge to the bottom edge of the aft spar. To get access to the damaged ribs requires at least drilling the rivets in the upper or lower surface of the skin to pull it away and expose the ribs. We usually choose the lower skin so any paint touch up work is less obvious. 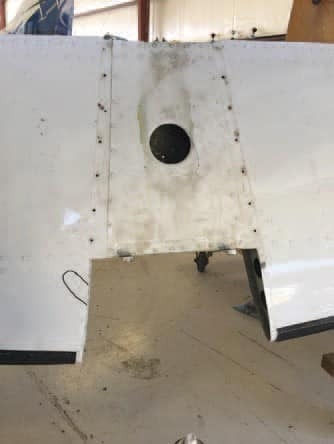 A bent and cracked nose rib inside a Cessna 210 horizontal. To add insult to injury, the inboard edge of the leading edge skin is overlapped by a center skin. That center skin must be at least partially removed to get the leading edge skin away. The kicker is that the horizontal must be removed from the airplane to remove the center skin. Removing the horizontal includes removing all the tail feathers. Now we’re not just replacing ribs. This has turned into major surgery including disassembly of two primary flight control systems and one secondary flight control. This is definitely not a job one would assign to a junior mechanic. In addition, one should expect to have in-progress inspections and a VERY detailed post maintenance operational check as well. A crack in the right leading edge skin as a direct result of handling abuse. The same crack highlighted with marker. It takes about twenty-four man hours to remove and reinstall all the tail feathers, including rigging checks. The repair time for the horizontal varies, depending on the extent of the damage and the aircraft model. Should the horizontal repair be outsourced to a specialty shop, the cost of crating and shipping must be considered. Down time will depend greatly on who/where the horizontal repair work is performed. Suffice it to say, the cost is measured by thousands of dollars, not hundreds. The Benjamin Franklin axiom “An ounce of prevention is worth a pound of cure” is most applicable to these horizontal stabilizers. When a broken nose rib is discovered, it can’t be ignored. As a primary structural item, it’s considered an airworthiness issue and thus can’t be passed over during annual inspection. As an educated owner, you may never do the dirty deed of pushing on the horizontal. You may have fallen victim to the actions of the previous owner or his/her operatives. You may be the victim of your own current aircraft handlers. Regardless of who is/has done what/when, now is the time to re-educate everyone we can about this very preventable problem.